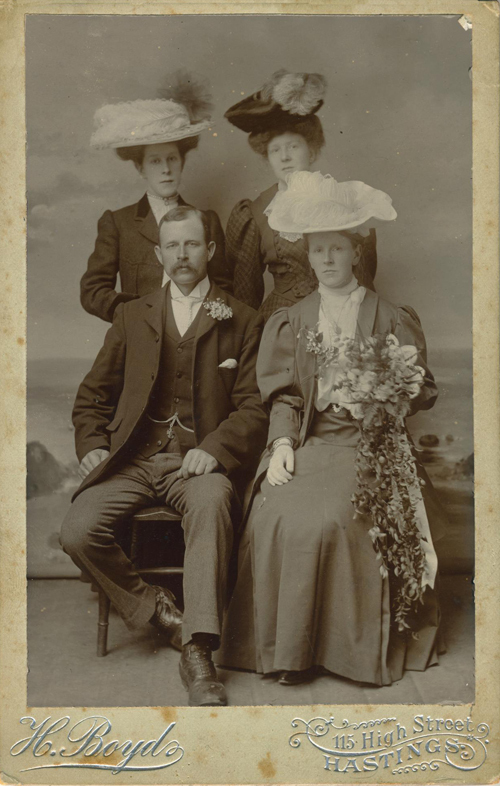 [ABOVE] A wedding group photographed at the studio of Harry Boyd of 115 High Street, Hastings (c1906). This cabinet portrait belonged to the Squire Family of Burwash and Hastings and probably records the marriage of Alice Maude Squire (born 1870) and Tom Carter (born 1870, Netherfield, Sussex), a grocer, who married in Hastings during the 2nd Quarter of 1906. It appears that early in 1903, Alice Squire had given birth to a son named Edmund Kenneth Squire in Toxteth Park, Liverpool and, after her marriage to Tom Carter, she produced a daughter named Florence. [The birth of Florence M. Carter was registered in the Sussex district of Battle during the 4th Quarter of 1911]. At the time of the 1911 census, Tom and Alice Carter, together with their 8 year old son (recorded under the name of 'Edmund Kenneth Carter') were living at Tom's grocery store in Netherfield Hill, Battle. It is thought that the two young ladies standing behind the bride and groom are [Sophia] Jessie Squire (born 1877, Burwash, Sussex) and Florence Jane Squire (born 1879, Burwash), Alice Squire's younger sisters. The photographer, Harry Bartram Boyd (1868-1954) arrived in Hastings from London around 1899 and by 1901 he had purchased a photographic portrait studio at 115 High Street, Hastings from J. D. Ablett. Harry Boyd operated a number of studios in Hastings between 1899 and 1909, but he appears to have closed his portrait studio at 115 High Street, Hastings around 1907. Josiah Squire was born in Mersham, Kent, in 1823, the youngest son of Frances and Lawrence Squire (1783-1867), a grazier or livestock farmer, who originated from Folkestone, Kent. Josiah Squire, the ninth of nine children born to Frances and Lawrence Squire, was baptised at the church of St. Mary & St. Eanswythe, Folkestone, Kent, on 12th November 1823. At the time of the 1841 census, Josiah Squire was living with his parents at Cheeseman's Green, Mersham, but in his twenties he apparently moved to London. When the census was taken on 7th April 1861, Josiah Squire was living in South London at 6a Brighton Place, Lambeth, Surrey. On the 1861 census return, Josiah Squire gives his occupation as "Tea Dealer". During the 2nd Quarter of 1868, in the South London district of Lambeth, Josiah Squire, who was then in his mid forties, married Fanny Burgess, a young Sussex woman who was some 17 years younger than her husband. (Fanny Burgess had been born in 1840 in the village of Ewhurst, near Battle, Sussex, the daughter of John and Fanny Burgess, being christened in the local church on 4th October 1840). In 1851, Fanny's father, John Burgess (born c1803, Ewhurst) was a farmer of 100 acres in the Playden district of Sussex. Fanny was pregnant at the time of her marriage and a few months after the wedding she gave birth to a daughter, Fanny Louisa Squire. [The birth of Fanny Louisa Squire was registered in the South London district of Lambeth during the 3rd Quarter of 1868]. 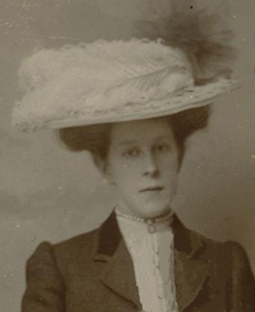 Fanny Louisa would be the first of eight daughters born from the union of Fanny Burgess and Josiah Squire: (1) Fanny Louisa Squire (born 1868, Brixton, Surrey); (2) Elizabeth Agnes Squire (born 1869, Brixton, Surrey); (3) Alice Maud Squire (born 1870, Brixton, Surrey); (4) Annie Maria Squire (born 1872, Brixton, Surrey); (5) Caroline Kate Squire (born 1874, Brixton, Surrey); (6) Sophia Jessie Squire (born 1877, Burwash, Sussex); (7) Florence Jane Squire (born 1879, Burwash, Sussex) and (8) Mabel Isabel Squire (born 1883, Burwash, Sussex). Two of Josiah Squire's daughters did not live to see their 21st birthday. Mabel Isabel Squire died in 1885 when she was two years old. Annie Maria Squire, who was mentally handicapped, died in Burwash in 1893, aged 20. During the 1870s, Josiah Squire ran a grocery shop in Brixton Road, Brixton, in the South London district of Lambeth, but by the end of 1877, Josiah and his family had moved to Sussex where he hoped to make a living as a farmer. Josiah Squire acquired 120 acres at Bines Farm, Witherenden Hill, Burwash. Bines Farm had been previously used to plant up hops and grow wheat. The 1881 census records Josiah Squire, his wife Fanny and his 7 daughters at Bines Farm House, Burwash. On the census return, Josiah Squire is described as a "Farmer of 120 acres" employing 4 men and 1 boy. Mrs Fanny Squire was assisted in her housekeeping by her younger sister Kate Burgess (born 1852, Iden, Sussex). Around 1895, Josiah Squire sold Bines Farm to an elderly widow Mrs Caroline Vickery* (born c1815 Folkestone, Kent). It appears that Josiah Squire was in poor health as he died near Maidstone, Kent, early in 1898 at the age of 74. After the death of her husband, Mrs Fanny Squire, moved to Hastings with three of her unmarried daughters to take possession of a public house. Mrs Fanny Squire took over The Privateer Inn in Cross Street, Hastings. The 1901 census records Mrs Fanny Squire, a 60 year old widow, as a "Publican" at The Privateer Inn, 2 Cross Street, Hastings. Thirty-one year old Lizzie (Elizabeth) Squire and her younger sister, (Sophia) Jessie Squire, aged 23, were both working at The Privateer Inn as barmaids. 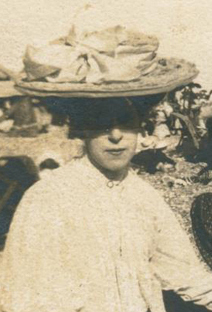 Mrs Squire's youngest surviving daughter, 21 year old Florence Squire, was employed as a "School Assistant". By this date, two of Mrs Fanny Squire's daughters had found husbands; In 1898, in the town of Hastings, Caroline Kate Squire had married Frederick James Seymour (born 1877, Barrow-in-Furness), a 21 year old "stud groom" and the following year, in her old parish of Burwash, Miss Fanny Squire had married Ernest Albert Drawbridge (born c1874, Horne, near Godstone, Surrey), a carman employed by a corn merchant. Another daughter Alice Maude Squire was to give birth to a son named Edmund Kenneth Squire in Toxteth Park, Liverpool in 1903, but she did not marry her husband Tom Carter (born 1870, Netherfield, Sussex) until 1906. 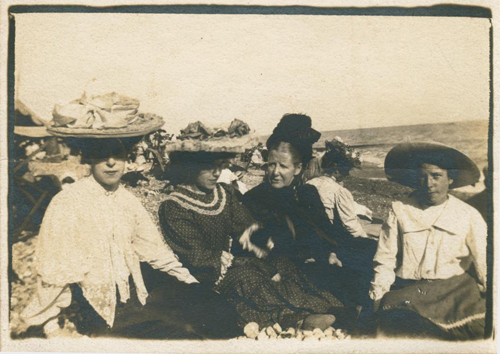 [See the wedding group photograph by H. Boyd of Hastings on the left]. Mrs Fanny Squire vacated the public house in Cross Street, Hastings some time after 1905. When the 1911 census was taken, Mrs Fanny Squire, was described as a 70 year old widow running a fancy needlework shop at 129 Queens Road, Hastings. Mrs Squire's 3 unmarried daughters - Lizzie (Elizabeth) Agnes, aged 41, Jessie Sophia, aged 33 and Florence Jane, aged 31, are described on the 1911 census as working "at home", so presumably were assisting their mother in her fancy needlework business. The 1915 edition of Kelly's Directory of Sussex records Mrs Fanny Squire as the proprietor of an 'Art Needlework Depot' at 129 Queens Road, Hastings. 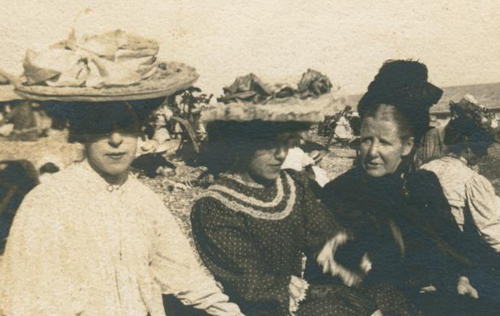 [ABOVE] An informal photograph taken around 1900 on Hastings beach. The lady dressed in black (centre right) is Mrs Fanny Squire (born 1840, Ewhurst, Sussex), the widow of Burwash farmer Josiah Squire (1823-1898). The two young women seated on Mrs Squire's right are thought to be Fanny Squire's daughters. When this photograph was taken, Mrs Fanny Squire was aged around 60 and had recently become the licensee of The Privateer Inn in Cross Street, Hastings. Mrs Squire opened a fancy needlework shop at 129 Queens Road, Hastings around 1906. Mrs Fanny Squire died in the Battle district of Sussex in 1929, at the age of 88. [ABOVE] A detail of the Hastings beach photograph illustrated above. The young woman on the left has been identified as Jessie Squire. 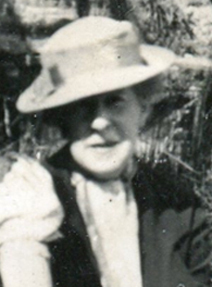 Born in the Sussex village of Burwash as 'Sophia Jessie Squire' in 1877, Jessie Squire was the sixth of eight daughters born to Fanny Burgess (born 1840, Ewhurst, Sussex) and Josiah Squire (1823-1898) who between 1877 and 1896 farmed 120 acres at Bines Farm, Witherenden Hill, Burwash. Although she never married, Jessie Squire fostered Winifred Ivy Hayes for 20 years, from the girl's birth in 1923 until Winifred married in 1942. 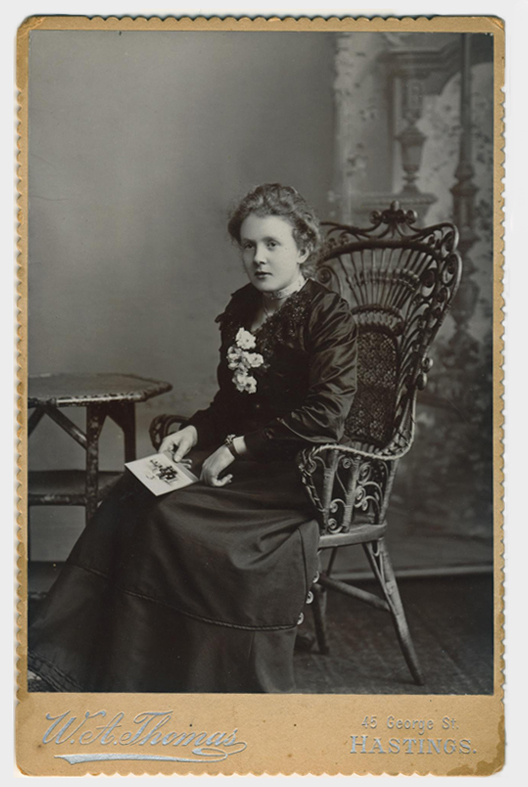 [ABOVE] A portrait of a young woman, a cabinet format photograph by W. A. Thomas of 45 George Street, Hastings (c1907). This cabinet portrait belonged to the Squire Family of Burwash and Hastings and is thought to depict Florence Jane Squire (born 1879, Burwash), the youngest surviving daughter of Josiah Squire and Fanny Burgess. The photographer William Arthur Thomas (1867-1927) was the son of the veteran Hastings photographer John Wesley Thomas (1831-1908). William Arthur Thomas took over his father's studio at 45 George Street, Hastings around 1900. This portrait was probably taken around 1907. 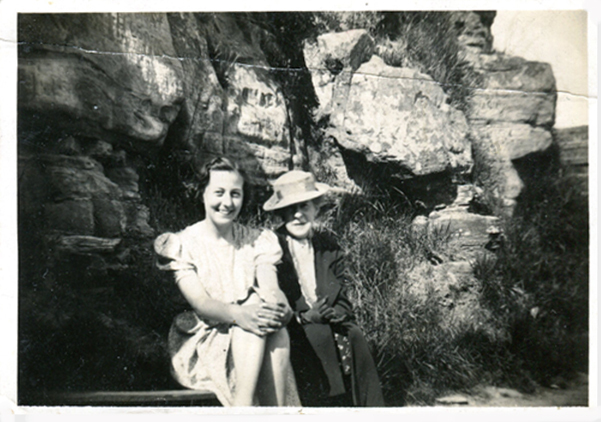 [ABOVE] Miss Jessie Squire (born 1877, Burwash, Sussex) photographed with her foster daughter Winifred Ivy Hayes (born 1923, Canterbury, Kent) on Lovers' Seat, a stone ledge set in the cliffs at Fairlight, overlooking the sea near Hastings. Lovers' Seat had been a well-known Hastings landmark since the late 18th century. 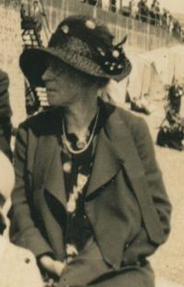 Even though she was not a blood relative, Miss Jessie Squire raised Winifred Hayes from Winnie's birth in 1922 until 1942, the year that Winifred Ivy Hayes married Kenneth Hart. [RIGHT] Winifred Ivy Hayes (born 1923), the young girl who was fostered by Miss Jessie Squire photographed around 1934. In 1942, Winifred Ivy Hayes married Kenneth C. Hart and started a family of her own. Raised in Hastings by Miss Jessie Squire, Mrs Winifred Hart (formerly Hayes) ended her days in Hastings. Mrs Winifred Hart passed away peacefully at Old Hastings House, High Street, Hastings, on 13th July, 2014 at the age of 92. [ABOVE] Winifred Ivy Hayes, the young woman who was fostered by Miss Jessie Squire. 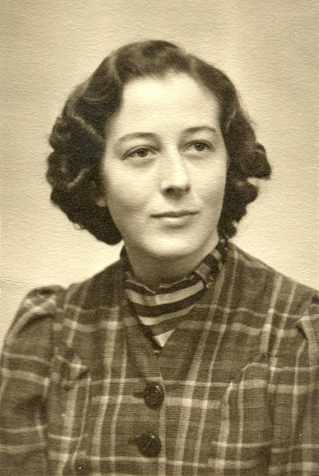 Winifred was born on 27th January 1923, the daughter of Rosemary Catherine Hayes. 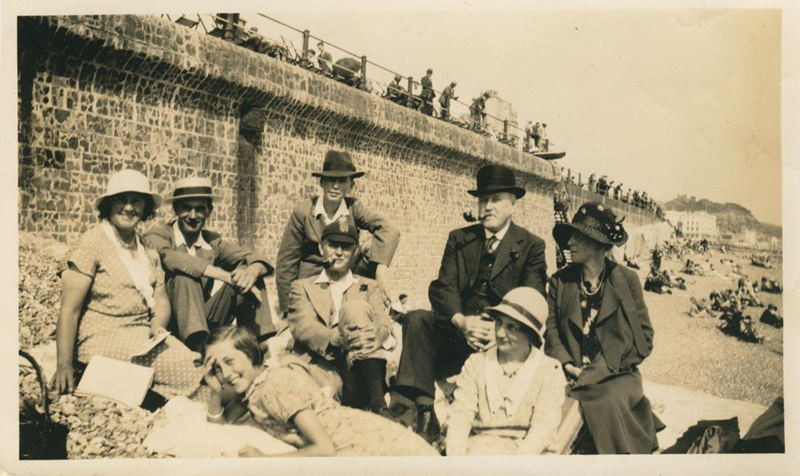 [ABOVE] Winifred Ivy Hayes (born 1923, Canterbury, Kent), the young girl in the foreground, photographed on Hastings Beach in the 1930s with members of the Squire Family. On the far right of the photograph is Miss Jessie Squire (born 1877, Burwash, Sussex) who raised Winifred Ivy Hayes from the year of Winnie's birth in 1923 up until 1942, the year that she married Kenneth Hart. Thanks to Peter Hart of Cambridge for providing these family photographs. Peter Hart is the son of Mrs Winifred Ivy Hart (formerly Winifred Hayes). From infancy, Winifred Ivy Hayes was raised by Miss Jessie Squire who served as Win's foster mother and was always known to the Hart family as "Aunt Jess". I am grateful to Peter for providing family history details relating to the Squire Family and his late mother Mrs Winifred Hart. I have made use of the following sources: Street & Trade Directories: Kelly's Directory of Sussex (1878, 1890, 1891, 1899, 1905, 1911, 1915); Kelly's Directory of Surrey (1878) on Historical Directories on Line (University of Leicester). Census Returns: 1841, 1851, 1861, 1871, 1881, 1891, 1901, 1911 on findmypast.co.uk. England Births and Christenings on FamilySearch.org.